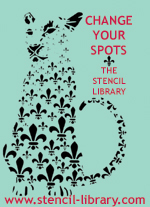 8 Projects to try using our stencil of dogs - Design Inspiration. Planet Stencil Library. This simple stencil of dogs is an enlarged version one of the free stencils given in the book Stencil It by Helen Morris. 'Stencil It' has sold out in the UK but is available in overseas editions. The free stencils were made of card rather than the polyester that we use for stencils that we sell. There were fifteen different ones in the book. Stencil a brolly for when its raining cats and dogs! The same dog design stencil is offered in many sizes and configurations on our website. Here are a few projects that I have stencilled using the dog pattern. A large stencil of a poodle was stencilled with white paint; whilst the stencil was still in place a black pattern was stencilled over it. A couple of coats of varnish make the pet mat wipeable. Applying the stencil brush work to the outer edges of the shape allows the gingham fabric to show through the stencilled imprint on this pet cushion. The SIB14-s Dog stencil is so easy to use, it is one that I employ when teaching children to use a stencil. The repeats are easy to follow and one can add extra interest by laying another stencil pattern over it. or applying texture through it. I used Polyfilla or something similar. Stencilled pin boards make a quick and easy craft project. My boards came from IKEA and were painted with matt household paint before stencilling. keys, or necklaces. Want to know what other canine stencils we sell? Typing the word dogs into the search on our site it will make finding them easier. The last photo is a still taken from the television programme 60 Minute Makeover starring Linda Barker. She used our dog stencil to decorate the walls of this home. I stencilled them onto a grey wallpaper that looked like linen and they pasted it onto the room. 'Stencil It' is available in many countries and in several languages. It can be ordered from Amazon.